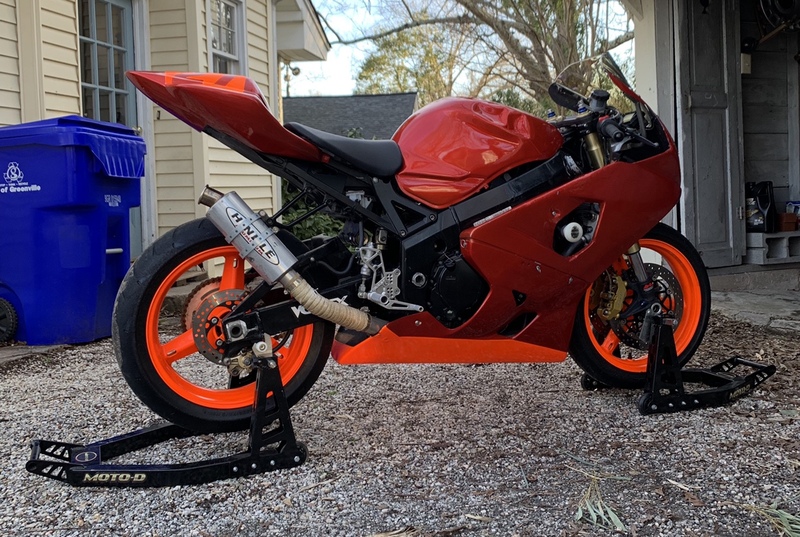 This is actually my first 4 cyl bike as my first two bikes were both Daytona 675s. Predat-R, tigerblade and HydeWhyte like this. Hello from Texas. Nice bike, I'd ride it! Thanks! So far it seems to be in great shape for the price. Where in SC? I'm just up the road in western NC. I love the orange, not so much the red. I'm a little ways up the road in NC but I get down in SC a fair amount. 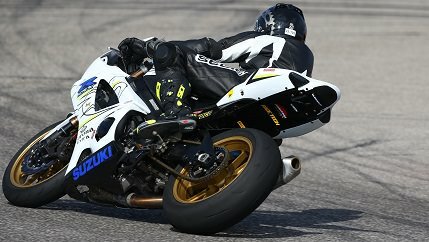 There are a number of us planning on VIR North April 1st and possibly CMP the week after. Check out Asheville Sport Riders group on FB. 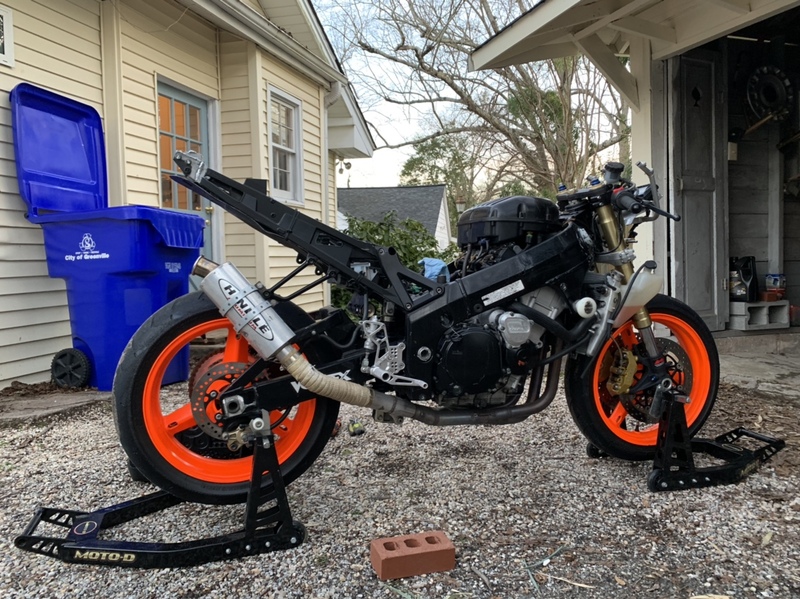 I think I'll keep posting on here to track my progress and give the story of the bike. 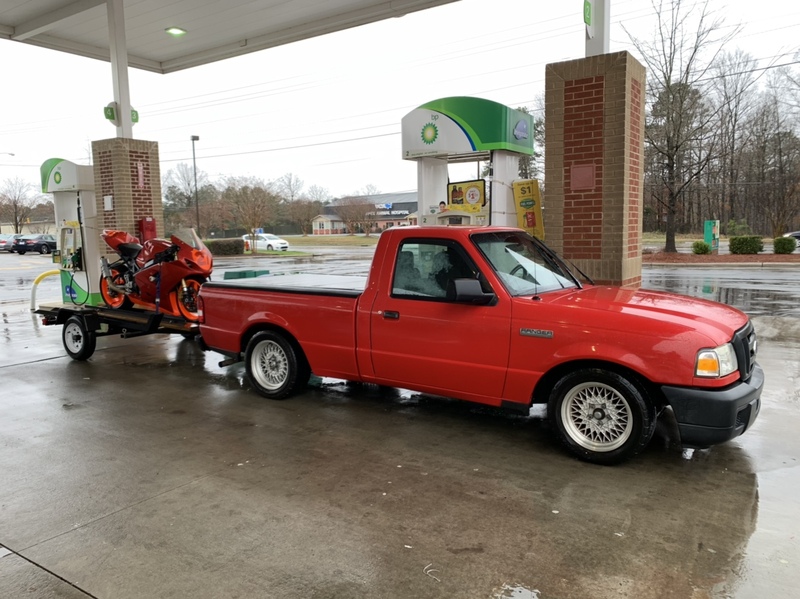 I bought the bike in Raleigh, NC, on 2/23/19 in some truly nasty weather. It's a 2004 which was written of in 2004 and has been a track bike since. I had to drive through rain the entire 8 hour round trip. Took a brief test ride in the rain, during which the 12 year old rear tire proved it had basically no traction... 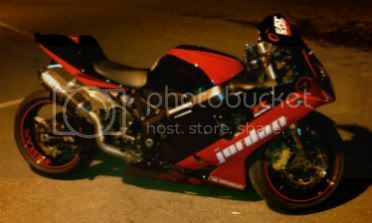 The bike ran well though and I couldn't find anything that seemed really wrong with it for the price so I took it. 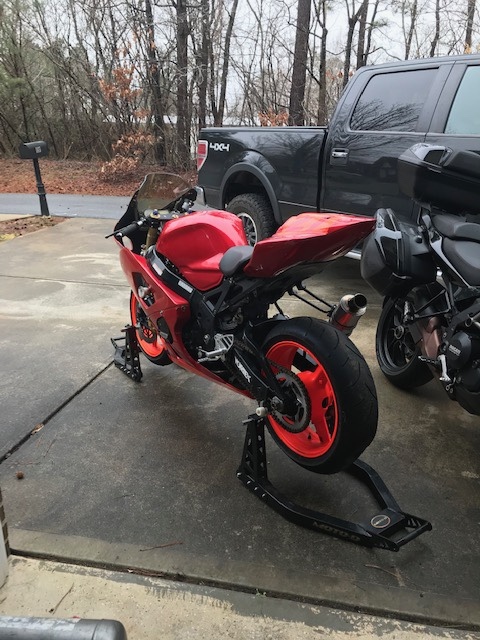 The seller only had it a couple of months before deciding he wasn't going to have time to do many (if any) track days this year and decided to just go ahead and pass the bike along. 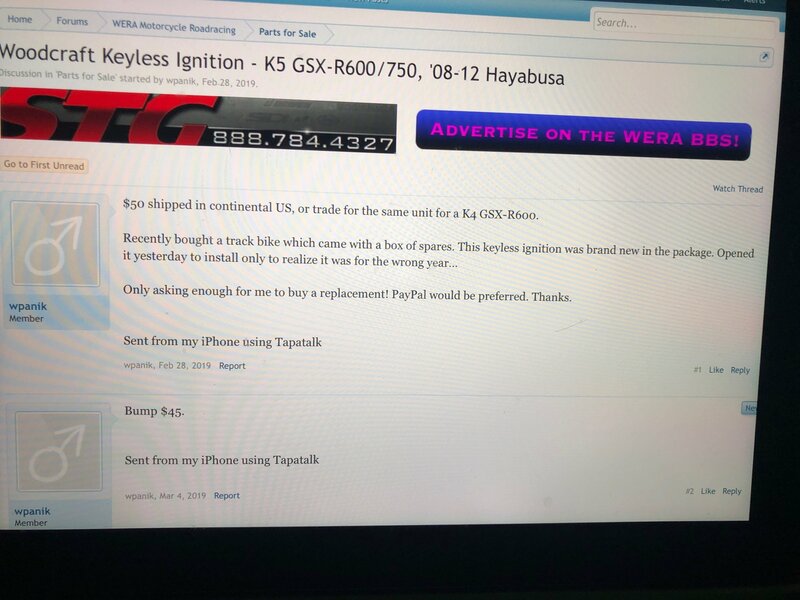 He actually found me asking about another bike in a forum, and a week later I was at his house. Included with the sale was race body work, Vortex clip ons, Vortex rear sets, Vortex sprockets, 520 chain (which needs replacing), aftermarket mystery headers and mid-pipe with a Hindle slip on, spare tank, new in box keyless ignition, new in box Motion Pro throttle cables, new in box iridium plugs, extra fuel tank, front and rear stands, and then forks, an Ohlins steering damper, and a Penske rear shock which were all serviced in November. 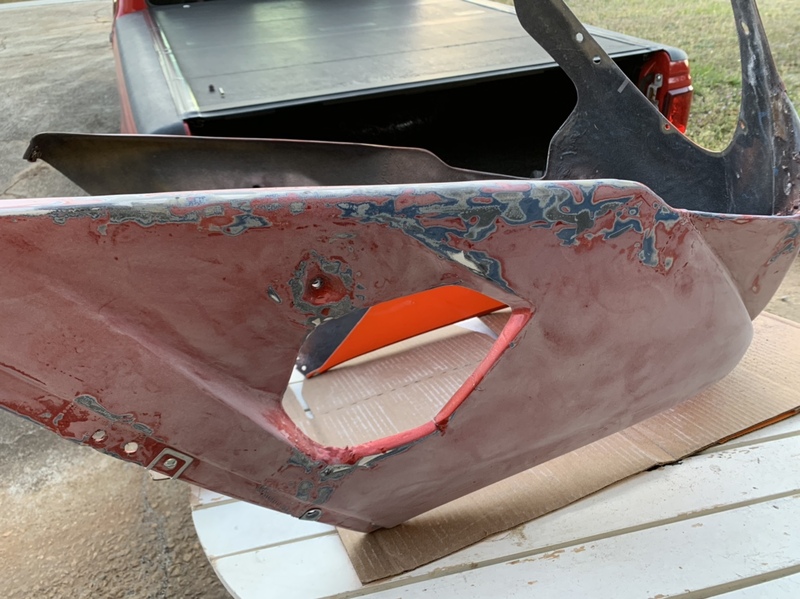 The next day I started peeling off body work to see what I had gotten into and uncovered the best of surprises: it looks pretty dang solid! All of the electrics had actually been well taken care of during conversion and everything was neatly stored. I decided to go over a bunch of preventative maintenance stuff just so I knew where I was starting. I don't have a great place to work so it got moved to a top secret garage I'm bumming in for a bit. The first thing I did was peel off the tank and airbox to see what all was going on. 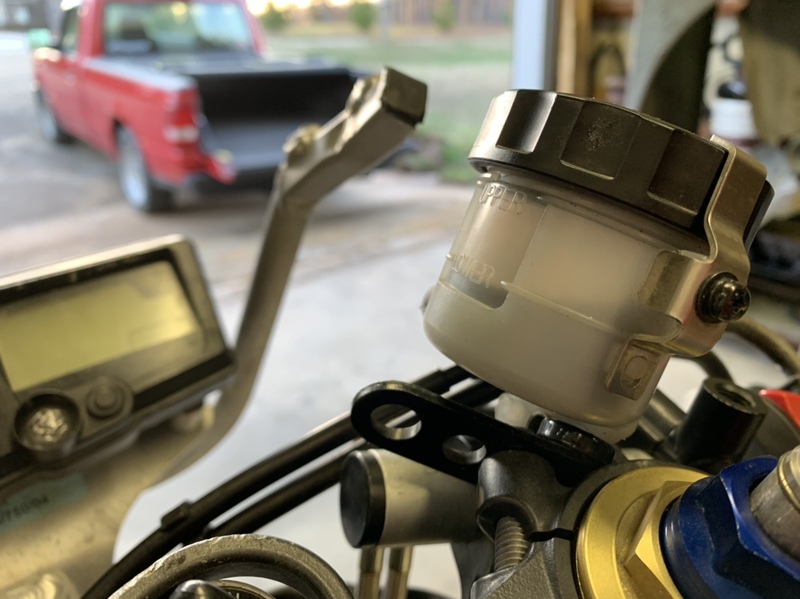 The air filter was a little dirty, but the secondary butterfly valves were still on the bike and appeared to function properly. 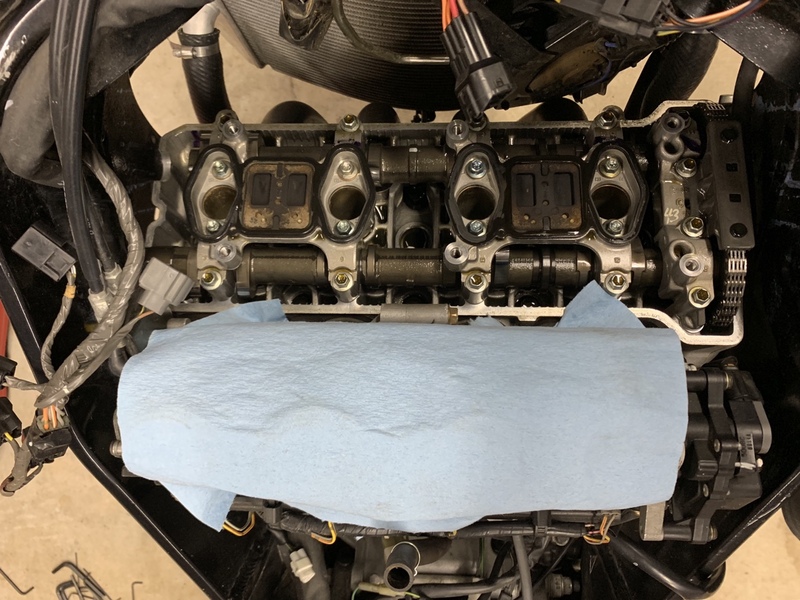 So after that, I took out the plugs and removed the valve cover. The plugs actually looked really good, but I'll replace them with the included iridium ones anyway. Everything looked good under the valve cover and all of the valves were solidly within their correct tolerances. 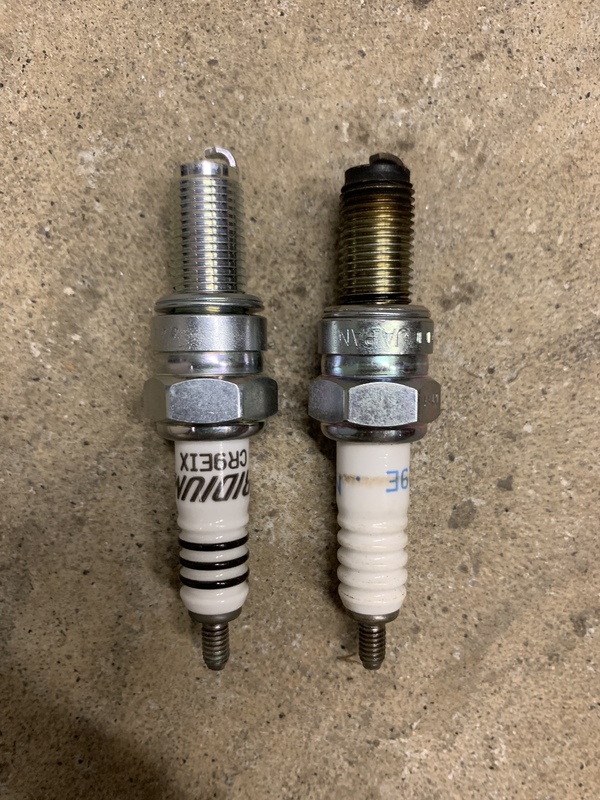 Up next (week) will be a compression test and installing the new plugs. A decent parts order should also come in next week which will lead to more stories to tell. If you made it this far, thanks! I'll try to do an update every day I work on it from here on out so posts should be a little more reasonable in length! Nice update. I'm sure you will get there, but a coolant check and flush should be included. Many track bikes have been left with just water in them and it shows. It's on the list, but thanks! I'll take any and all recommendations just to make sure I'm not forgetting anything. Thank you! Enjoying it so far. Many knowledgeable people here, you'll definitely get there. Looking forward to the help! Well I have to be honest, I did work on the bike last night, but I left pretty defeated so I didn't post. The first plan for last night was to do a quick compression check. 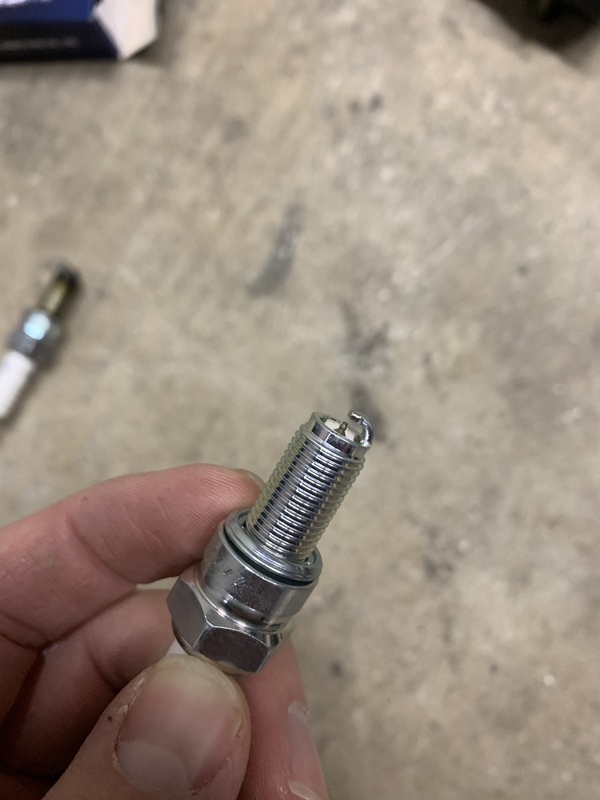 I rented a tester from a local auto parts store and bought a 10mm adapter to fit the bike's tiny spark plugs. The compression looked a little low (although above the stated minimum) but I believe that was due to the engine being cold. More importantly, compression was dead on equal between all 4 cylinders. Great! After that, in went the new iridium plugs. The old plugs actually looked pretty darn good, but I figured I might as well since I had them! Got everything back together aaannnddd…it ran like garbage. Rough idle, super rich, fireballs, stalling, etc. I tried switching back to the old plugs but that did nothing. That was when I called it quits for the night. Cut to today. I tried to research the problem but couldn't really find anything. 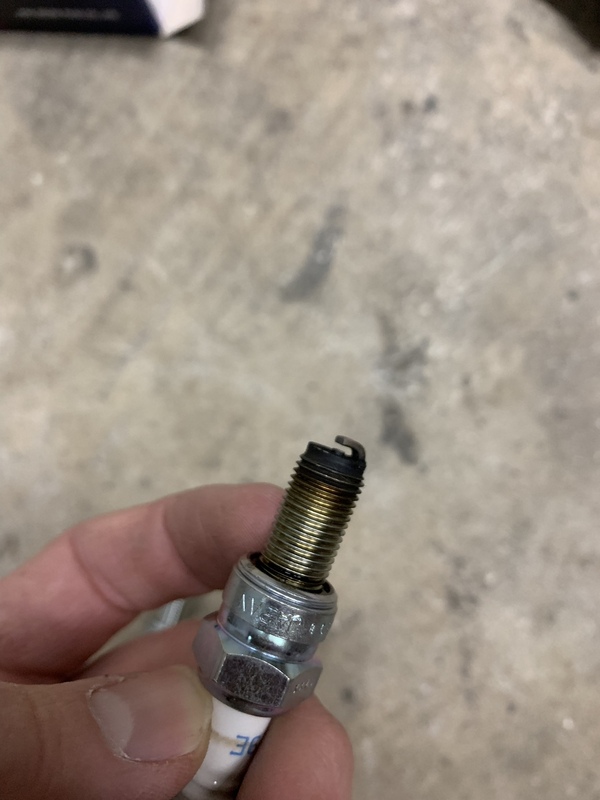 I thought it could have been a misfire caused by the ignition coils so I tested their resistance during lunch. Fortunately they all tested good, but that meant I was no closer to a solution. After work, I tried running it without the airbox so I could watch the secondary butterfly valves. Surprisingly…the bike ran perfectly. 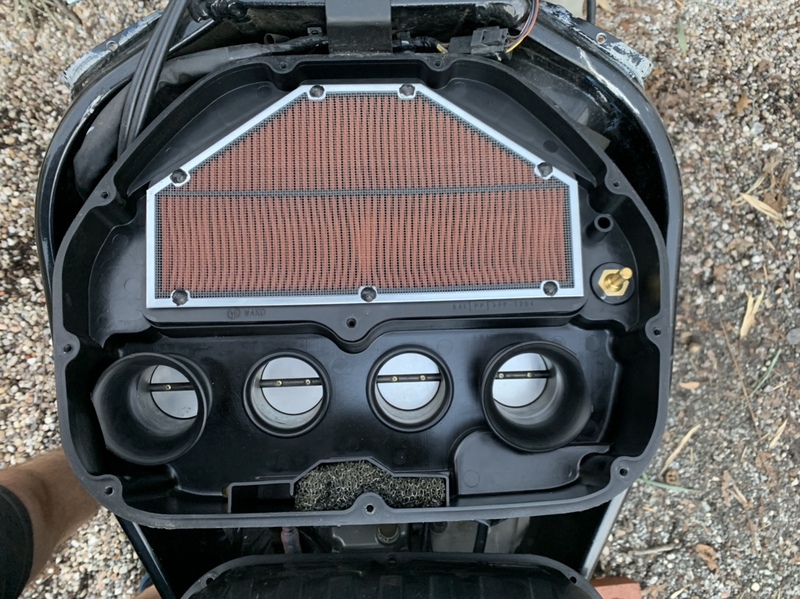 That seemed weird so I went ahead and put the airbox back on…and it ran like crap again. So now it's a process of elimination. I took out the filter and had the same problem. After that I decided to unplug the two sensors since they were the only things left. That fixed it! 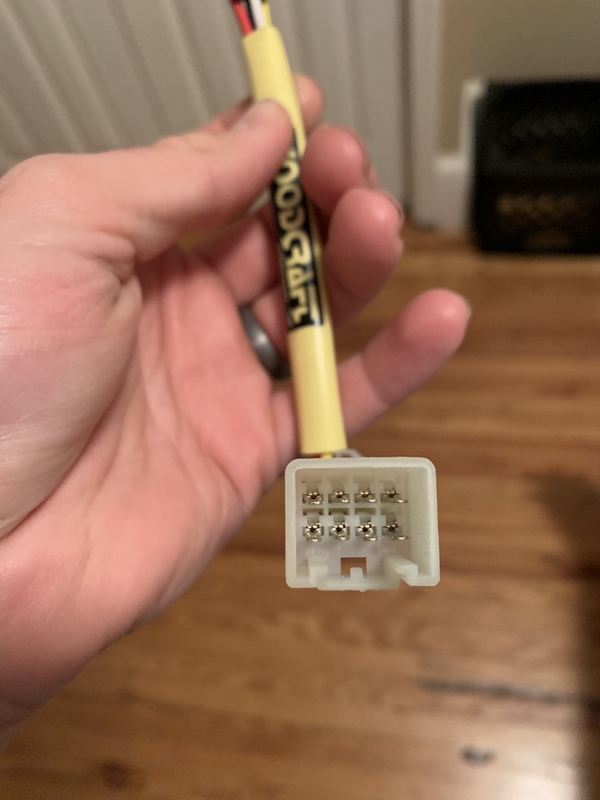 So now I had to figure out what the issue with the sensors was. With that, the bike is back to running perfectly! Next work day is an oil change and new brake fluid! 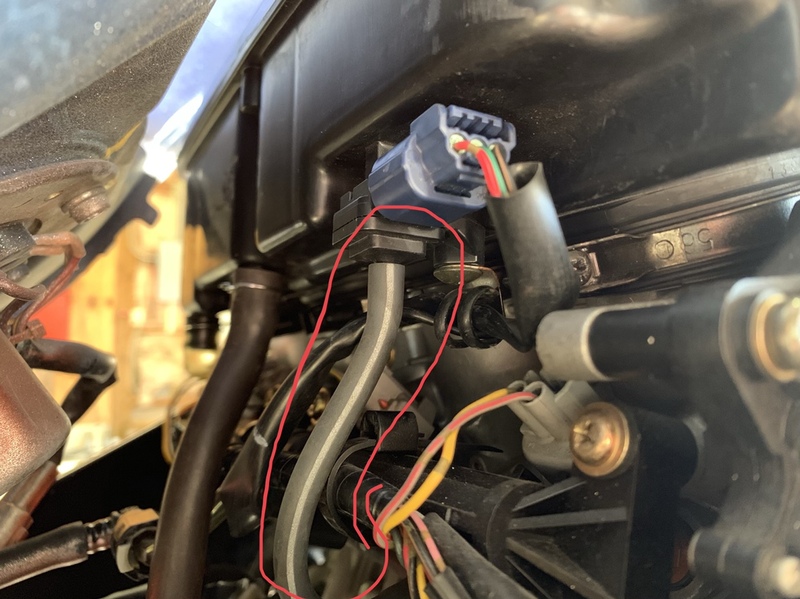 Yes, if that hose is disconnected the ECM will think the manifold pressure is wide open while the TPS is saying it is at idle. The bike will not be happy. 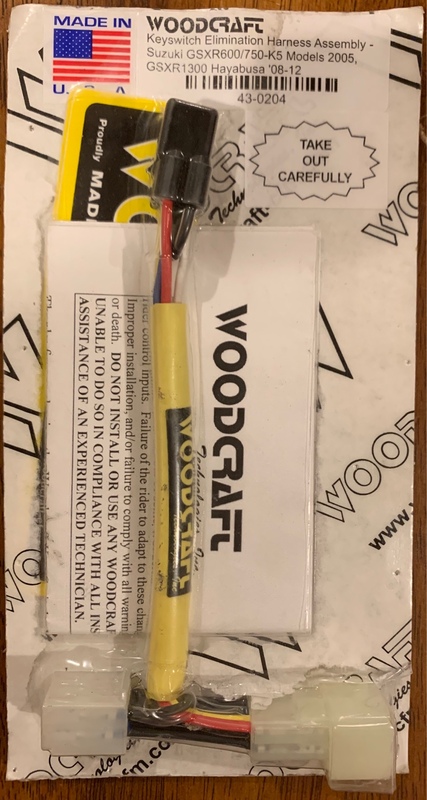 As I say to myself when facing a new issue after a repair; "It didn't do this before so it is likely something that I just did." No part of that probe actually went into the airbox so my friend and I are thinking it might be a vacuum line? Either way, that sensor definitely want getting whatever input it was looking for! I like your "something that I just did" quote, but that was also exactly what I was so afraid of haha. That hose should be connected to each of the throttle bodies. 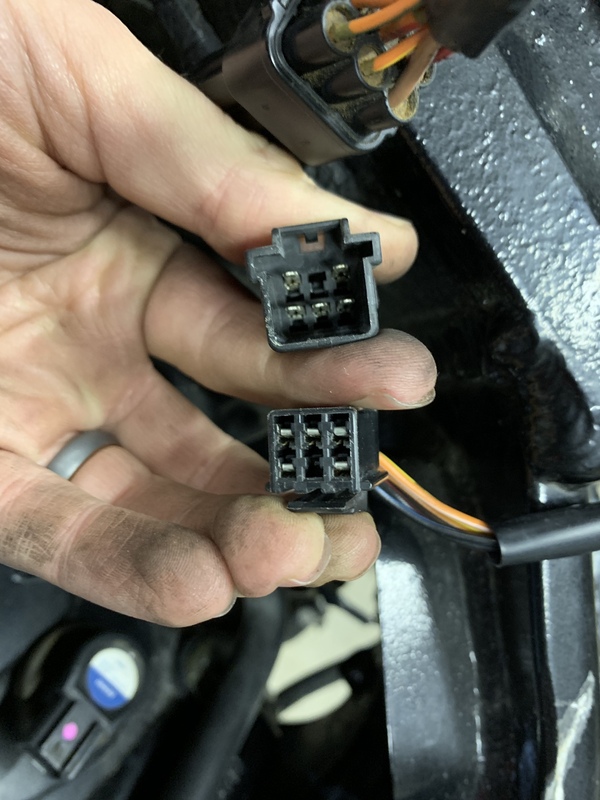 It has been the cause of some head scratching running issues that was eventually tracked to a leaking hose that was cracked due to age. These hoses are worth checking the next time you have the airbox off. 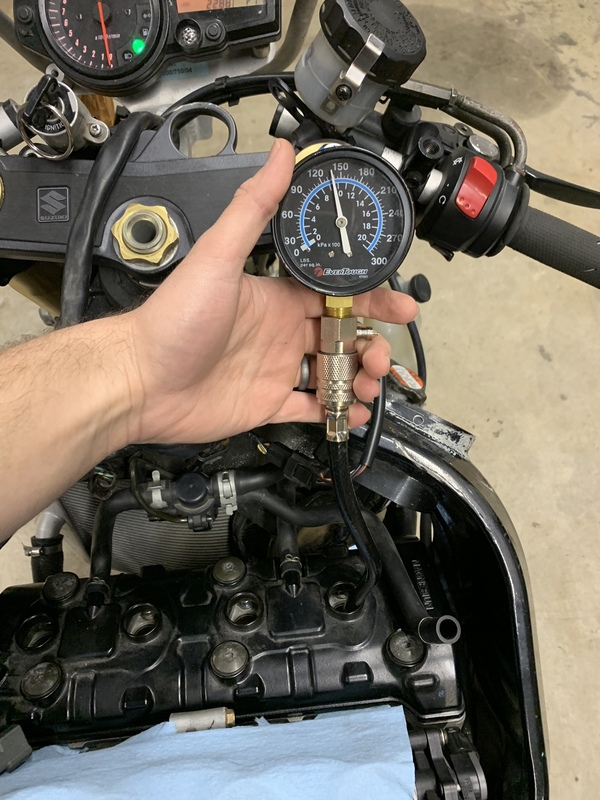 There is also an ambient pressure sensor somewhere on your bike. That sensor has a hose bib but nothing is attached to it as it is meant to be open to the ambient air pressure. Awesome! Thanks for the info. I did actually notice that those hoses all looked to be in particularly good shape. Maybe they had been replaced in the past. Last edited by wpanik; 03-06-2019 at 06:17 PM. Simple oil change today! Nothing too exciting. 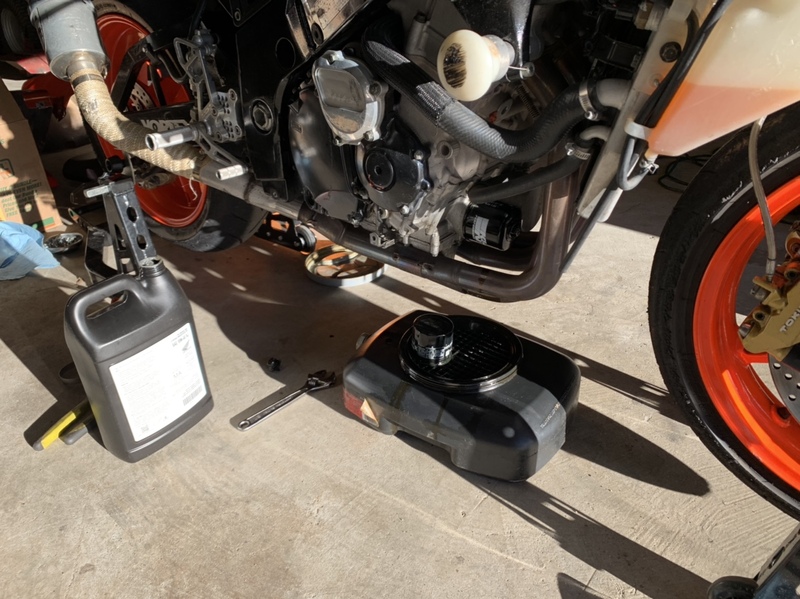 Unfortunately, it looked like the Motul oil I drained was actually in really good shape but better to be safe than sorry. I also had plans to change the brake fluid because I thought it looked awfully dirty. However, when I opened the reservoir, I realized it was really just a very dark blue color. The brakes actually feel really solid so I decided to leave it as-is. At this point I'm getting pretty close to being done. Everything has gone so smoothly that I'm way ahead of where I thought I'd be. Currently waiting on tires, a chain, and an air filter to arrive. After those I'll flush the coolant and eventually paint the fairings. If you think I've missed something, leave a reply! Isn’t the brake fluid level a bit low in the reservoir? Thanks for noticing/asking! It's actually not. The reservoir is sitting at a weird angle from being held on with a zip tie… If you level it out, it's well above the minimum full line. Ok. So I obviously got really behind on my “every day I work on it” updates, but whatever. Things have been crazy. 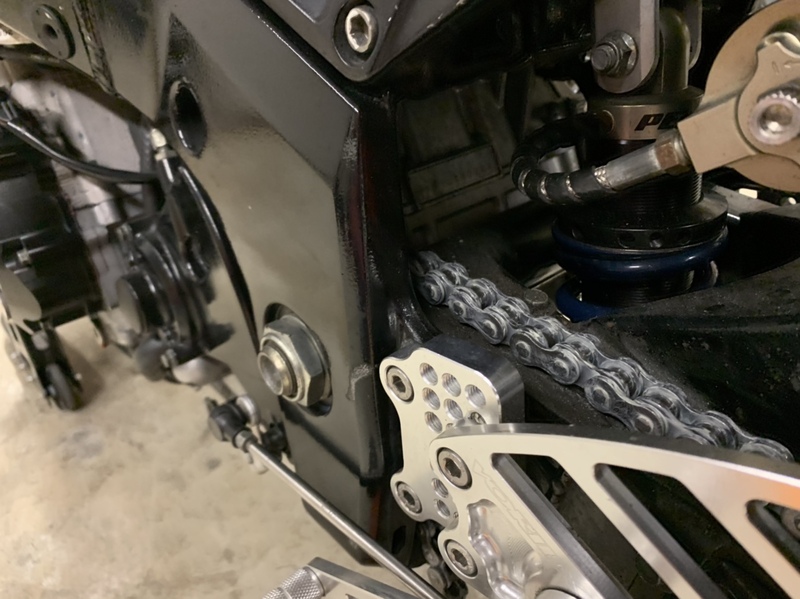 (3/8/19) The next step was a new chain. For a bike that had been so well taken care of, the chain was a disaster. It looks like it had almost never been cleaned. It also had a tight spot so bad that the chain wouldn’t even move in one spot and then be over tolerance in the next. The whole chain procedure went pretty well considering it was my first time doing one. 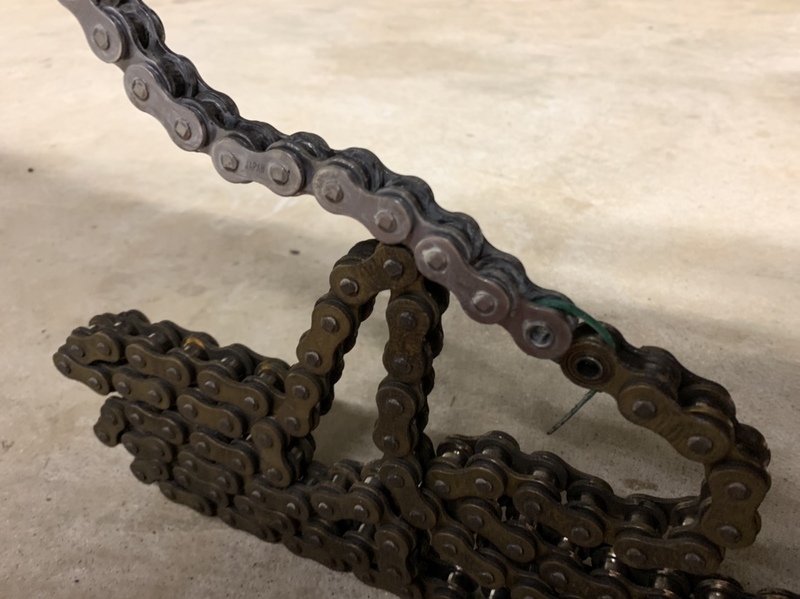 Two things I learned: 1) zip-tie the new chain to the old one to pull it through the front sprocket and 2) put the bike in gear when breaking or re-linking the chain to keep things in place. 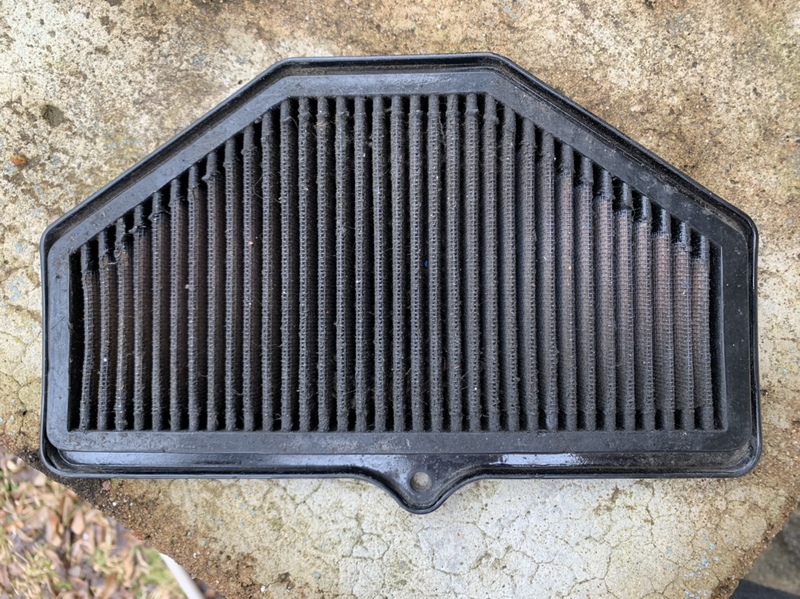 (3/10/19) The bike needed a new air filter. OEM was $35 and K&N or BMC were $60. For some reason I had an epiphany with this bike and decided to buy a used K&N and just…clean it. 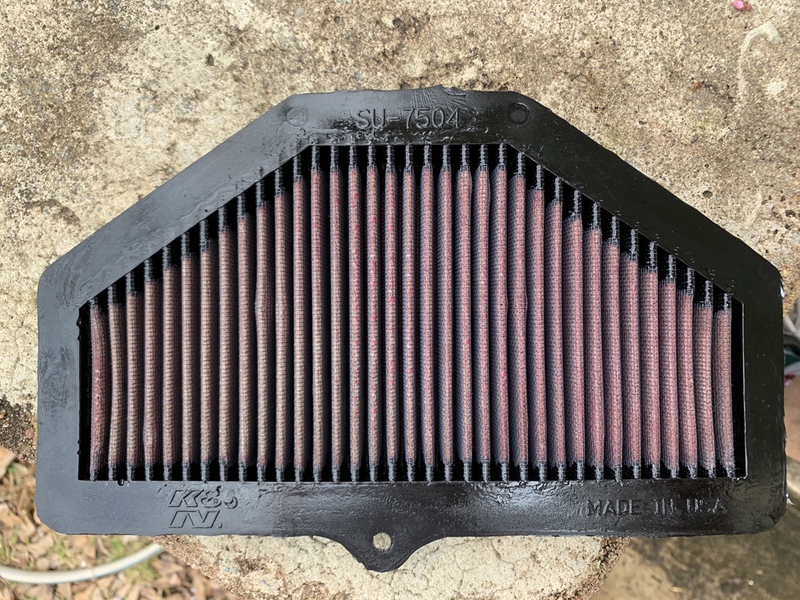 If the whole point of a K&N filter is that they can be reused, why buy one new? So I found one on eBay for $20 and that was that. 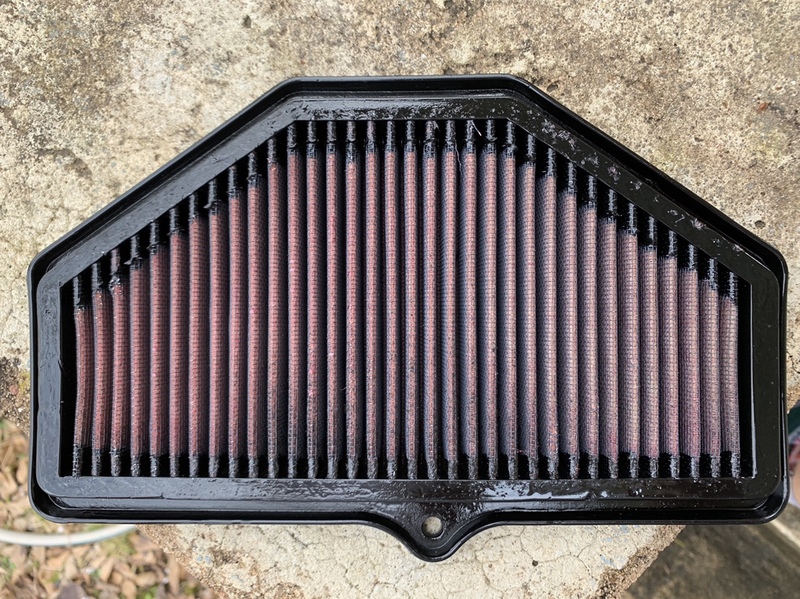 Before I go any further, I want to say that I know that oil-based filters are controversial and yada, yada…but this is what I went for and I’m fine with it. 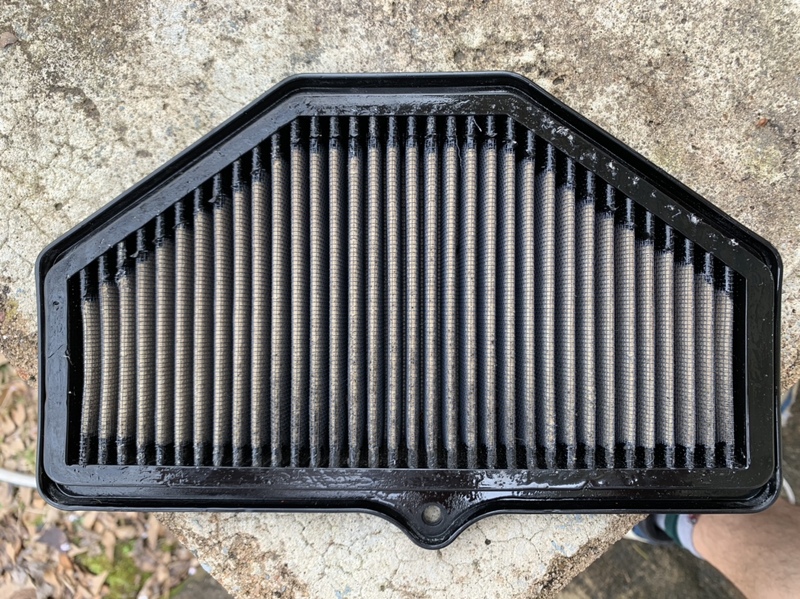 The filter I received was definitely very dirty, but in perfect physical condition. I spent a little extra time cleaning it out and it turned out like-new. Not a bad way to save $15-40! (3/26/19) I disappeared for a couple of weeks as I travelled. I think I did a couple of small things to the bike on different days, but nothing even worth taking pictures of. 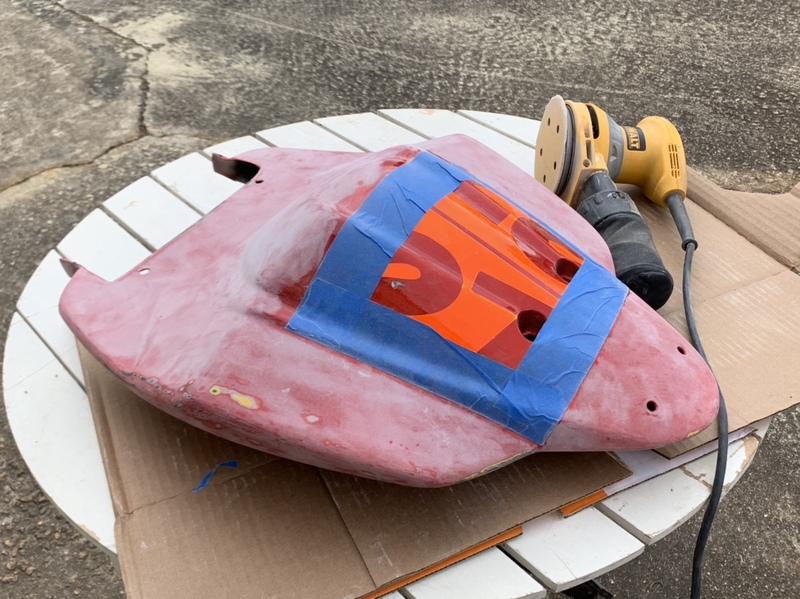 Yesterday I began sanding the red paint off. Part of me hated to do it with it actually being a decent coat of paint for a track application, but a much bigger part of me hates burgundy paired with neon orange. 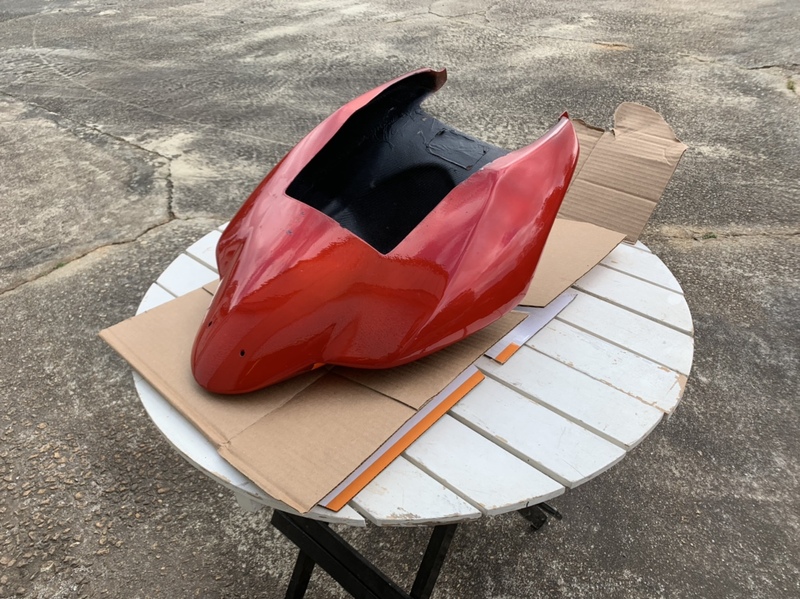 Today I should get the nose fairing done and get all the tight details and curves that are left with a Dremel. The other big thing today is that the new tires are going on! I’ll share pics of that in the next post. Thanks for continuing to read along! You did not mention that you changed the sprockets at the same time. That rear sprocket is done and will begin shedding teeth pretty soon. (aluminum). 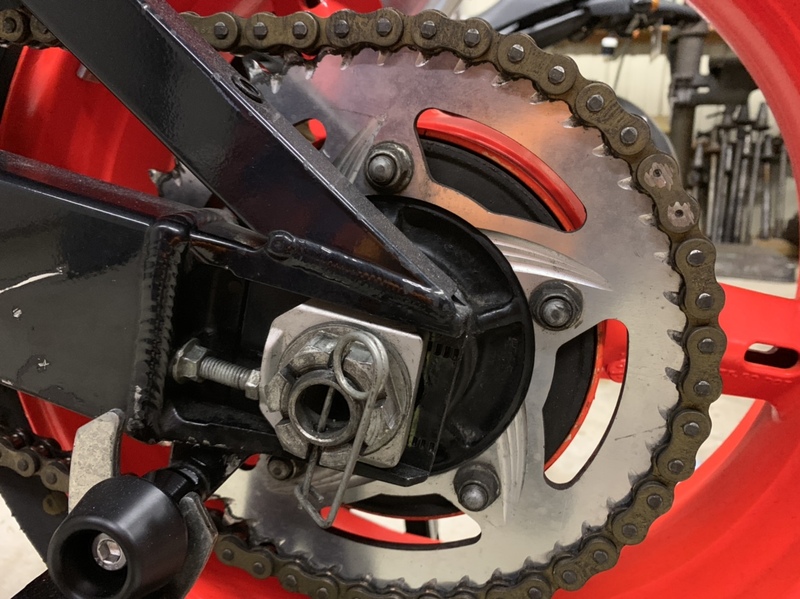 If the front sprocket is similar, it will not play happy with the new chain either. I'll post a different picture tonight. The sprocket is actually in pretty good shape. I think it just looks bad because of the grease in that picture. Last edited by wpanik; 03-27-2019 at 11:07 AM. Nice ride man...I found this for you if you’re still looking. Tried to copy and paste it but couldn’t make it happen.. I think that might be his ad. lol. or at least a guy in the exact same situation. Unless I knew when the brake fluid was last changed, I would flush the brake system personally. I'd change the fork oil, too. Nice job otherwise! The penske shock was a real score. I am going by the teeth being pointy and the asymmetrical wear in the valley on drive side. This is the last aluminum sprocket on my supermoto. Here are what the teeth look like on the new steel replacement. The old aluminum one is more worn than yours but yours is pretty far along. I’m with John - please change both the sprockets - the rear is definitely past its “use by date”. 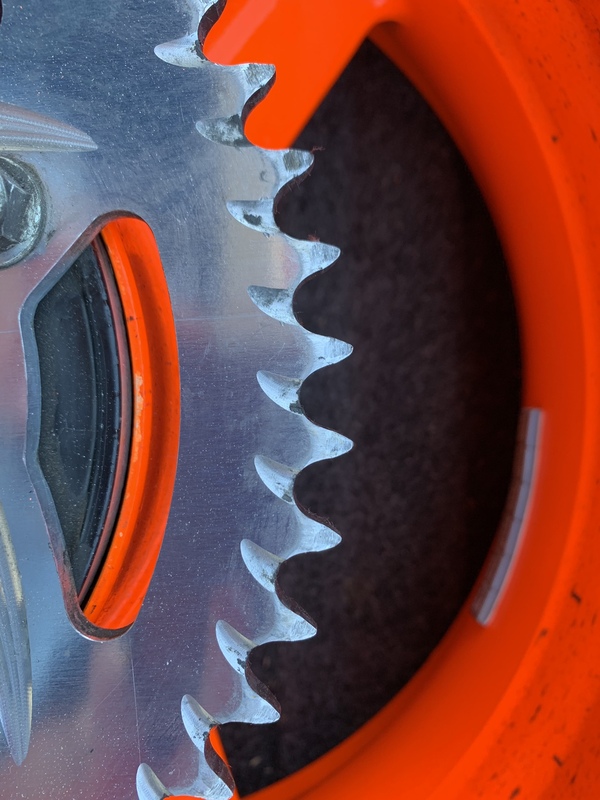 Even if the teeth don’t start breaking off, that new chain won’t last long with the profile of the sprocket teeth. A good rule of thumb is to always change the sprockets and chain together. The brakes have a really good feel and the fluid looked good so I'm leaving that for now. Forks, shock, and damper were all serviced in November! Here's a picture of the sprocket cleaned up. Really still think it needs to be changed? I just don't feel like it's that bad off. I'm curious wether the design that's machined into the sprocket was making it look more worn than it actually is? 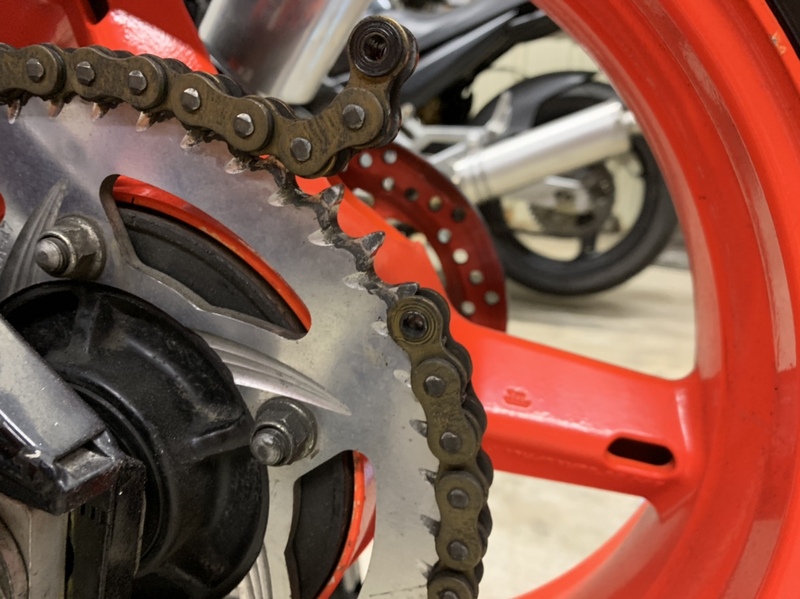 I totally understand changing chain and sprockets together, but I think these sprockets are a lot newer than the chain was. Hard to tell from that angle, but it does look better. How is the front? That is the more important one. If the front is worn with a new chain you will get a lot of chain noise and even some clicks and pops. BTW, the plan is for CMP on April 6th or 7th. Probably the 6th. In person, you can still see where it clearly transitions from the rounded section at the bottom to the flat near the top of each tooth. The front sprocket looks good. It also appears to be much newer than the chain I pulled off. Won't make CMP that weekend :/ April and May have shaped up to be super busy for me. Most of what I did last night was sanding so there's not a lot to share. The one thing I did spend some time on was the right side of the upper fairing. The bike had obviously been down on that side and hastily repared. I think the owner basically just slapped fiberglass on until the crack was gone. I took the time to try to sand all of that down to a somewhat even surface and will post a before and after once it's painted. There a still a few small cracks that I'm not planning to repair. 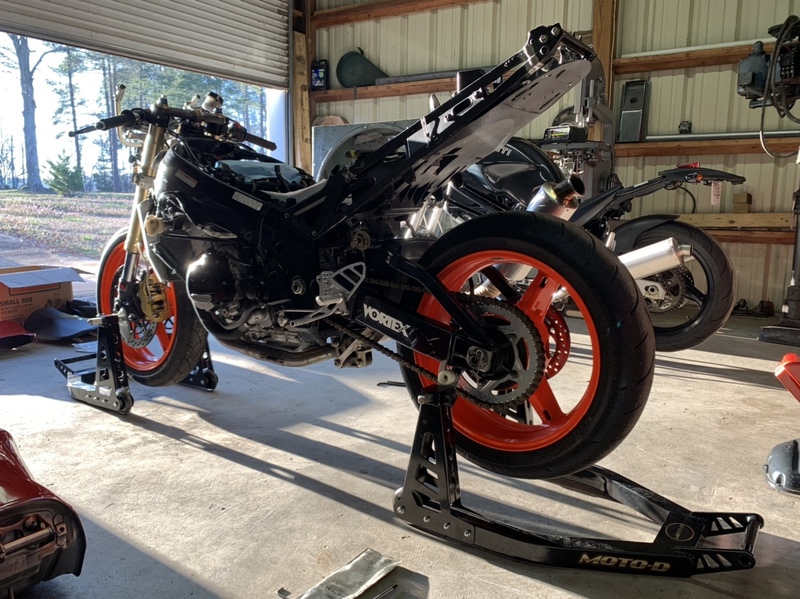 Ultimately this bike is a track rat and I'm fine with that. The other thing of note from yesterday was that I got the new tires mounted. The plan is to get out on those for a brief test ride some time next week! 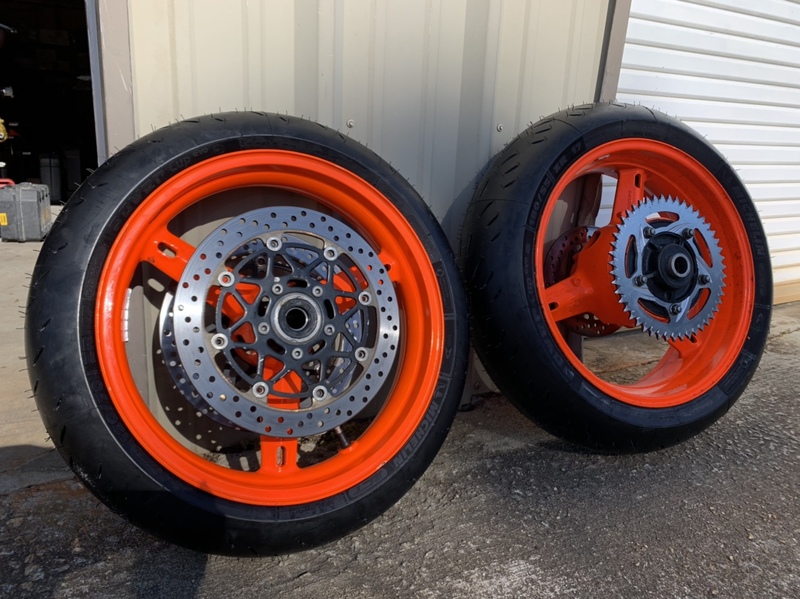 Just as a follow up from discussion after my last post: I'm considering both the front and rear sprockets to be in usable condition and will be keeping an eye on how they handle the new chain. Thanks for everyone's comments, questions, concerns, etc!